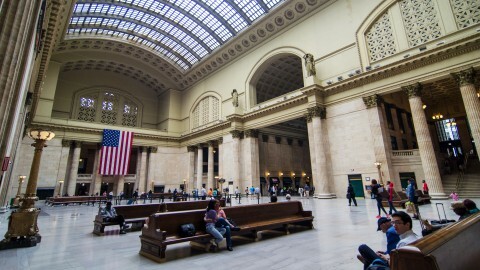 Chicago’s Union Station serves as an excellent example of Chicago’s historical standing as a transportation hub—a function retained to this day. 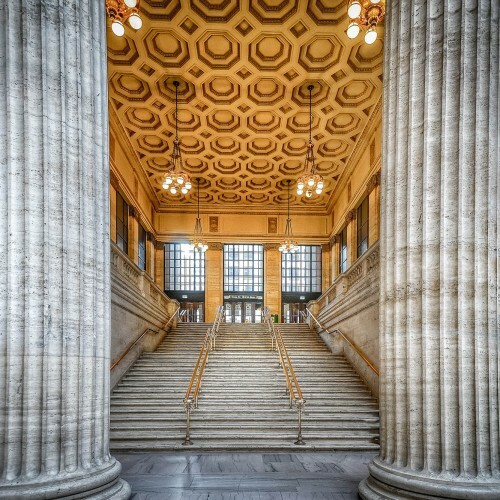 Named a Chicago landmark in 2002 and designated one of “America’s Great Places” in 2012 by the American Planning Association, Chicago’s Union Station is a staple among the city’s iconic architecture. Constructed at a cost of $75 million in the 1920s (more than $1 billion in 2017 dollars), Union Station anchors the West Loop. It brings in travelers from both coasts and disperses local commuters throughout the Chicago area. 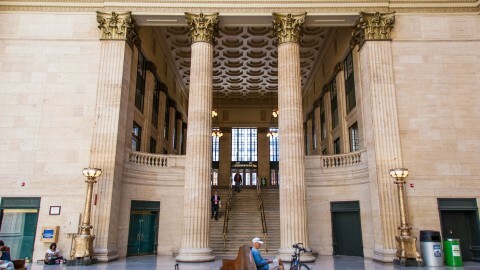 Union Station was originally built by a consortium of four railroads: Pennsylvania Railroad; Chicago, Burlington and Quincy Railroad; Michigan Central Railroad; and the Chicago, Milwaukee and St. Paul Railway. Architect Daniel Burnham envisioned the station as a major element in the development of the West Loop in his 1909 Plan of Chicago. He considered it prudent to consolidate train stations and free up land for development, as Chicago was in a growth phase following the Great Chicago Fire of 1871. However, Burnham did not live to see its completion. The design and construction were taken over by Graham, Burnham and Company (later known as Graham, Anderson, Probst and White) upon Burnham’s death in 1912. The doors opened in May 1925, after 10 years of construction. Union Station’s head house occupies an entire city block. 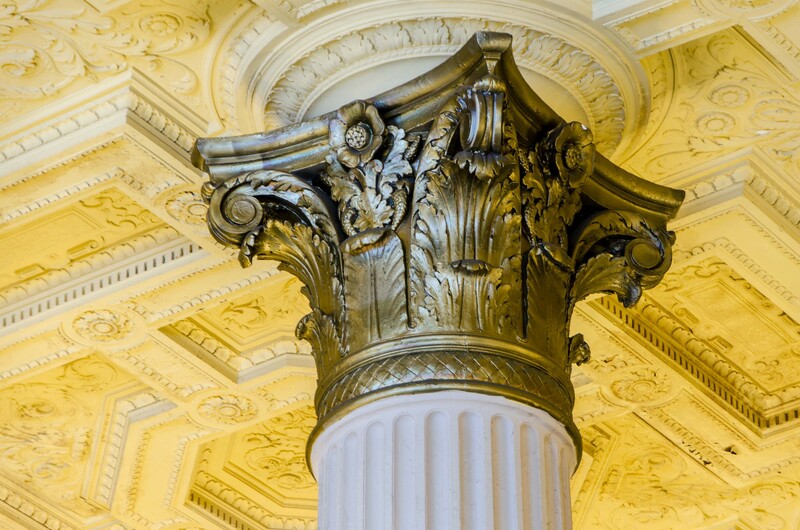 It was designed in the Beaux-Arts style favored by Burnham and clad in Bedford limestone quarried in Indiana. The main attraction in the head house is the Great Hall, with its 219-foot-long barrel-vaulted skylight that soars 115 feet above the ground. It was blacked out during World War II for security reasons and remains in need of restoration. Other original elements of the station that still exist include long oak benches, along with light fixtures and chandeliers decorated with birds, bees, butterflies and flowers. 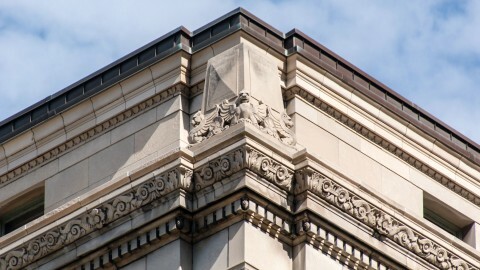 Two statues on the Great Hall’s east wall designed by Henry Hering represent day and night, a nod to passengers traveling on trains at all hours of the day. The head house used to have other smaller spaces that no longer exist or have a new use, including a small jail for prisoners being transported, a women’s lounge from the Victorian Era, a nursery and a first aid station. Two restaurants, Fred Harvey Coffee Shop and the Gold Lion, closed in 1980 after a fire swept through that part of the station. If Union Station looks like an ideal location for a movie set, that’s because it is. One of the most iconic scenes in recent cinema history, the famous baby carriage scene from the 1987 feature film The Untouchables, was shot in Union Station on the travertine staircase leading down from Canal Street to the Great Hall. 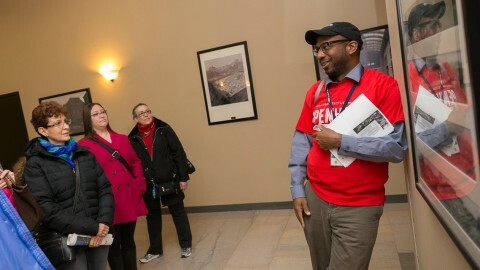 Since purchasing Union Station, Amtrak has overseen an extensive renovation effort that began in 2010. 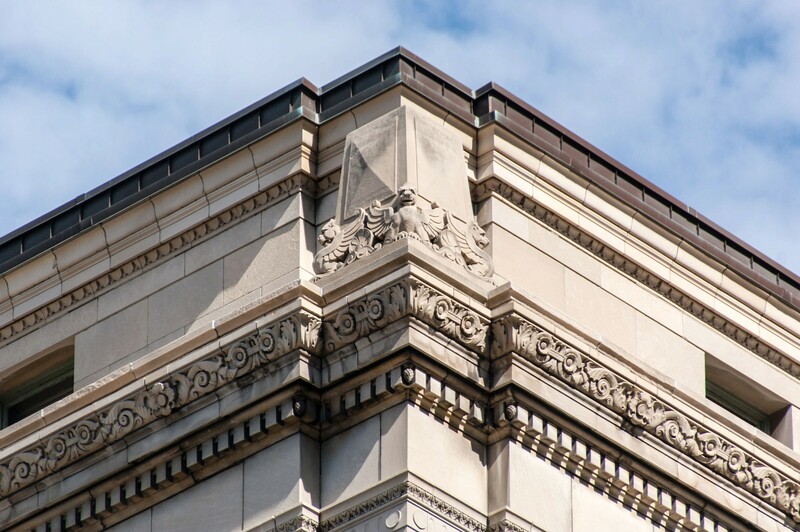 Facilities management firm CBRE and local architectural firm Goettsch Partners have guided the restoration. Initial improvements focused on infrastructure essentials, such as installing a heat pump, sprinklers and electrical transformers. Traffic patterns throughout the facility were reconfigured to minimize influxes of frigid winter air that were responsible for sprinkler pipe breaks in 2015. After being without air conditioning since the 1960s, the often oppressively hot Great Hall was cooled again with a HVAC system restoration in 2011. One of the most visible aspects of the Great Hall restoration was the replacement of the travertine on the staircases leading down from Canal Street. Decades of footfalls had worn parts of the stairs down to half their original 3-inch thickness. The staircase was also reconfigured to minimize tripping by squaring off the rounded “bull nose” edges of each step and the banister was extended from the bottom step to the landing. 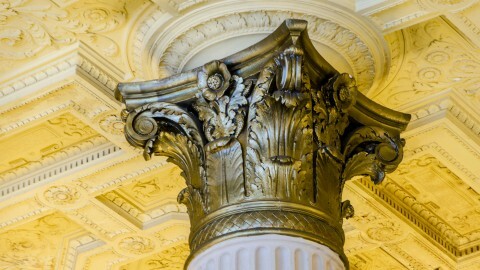 The new Legacy Club and Burlington Room (former women’s lounge) have been restored to reflect their previous glamour. In addition, the bi-level Metropolitan Lounge was relocated from the concourse to the head house and fitted out with sleek modern finishes and tech-friendly laptop and mobile charging stations. Also making a welcome reappearance in the Metropolitan Lounge after an absence of four decades: showers for long-distance travelers. Union Station originally included a concourse building on the east side of Canal Street, which was demolished in 1969 and the air rights sold. The remaining concourse functions are now largely located underground. Two office towers now stand on the site. Union Station is the only “double stub” station in the United States. Twenty-four tracks approach the station from two different directions. However, only four of them go through the station. 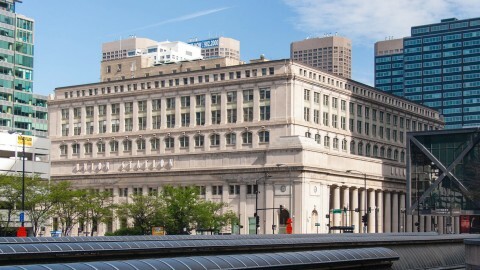 Chicago’s Union Station is the third-busiest station in the country – behind Grand Central Terminal and Penn Station, both located in New York City. 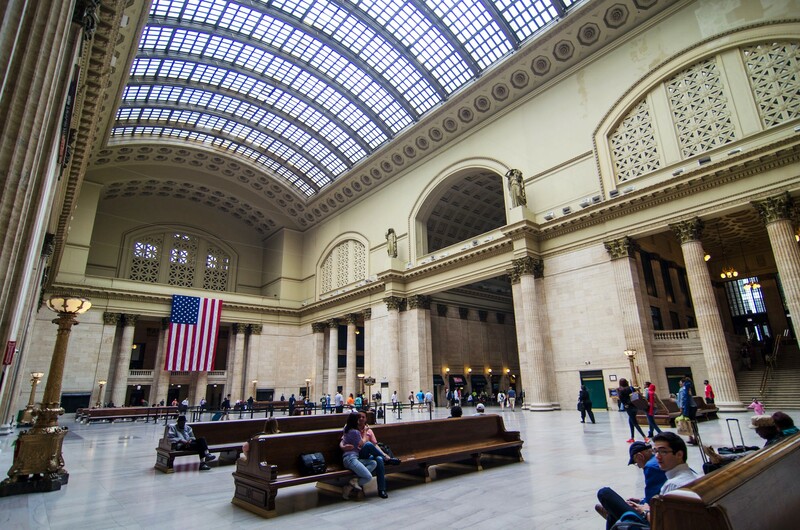 Despite great changes in transportation since its opening, Union Station remains busy—so busy, in fact, that it accommodates more passengers annually than Midway Airport. 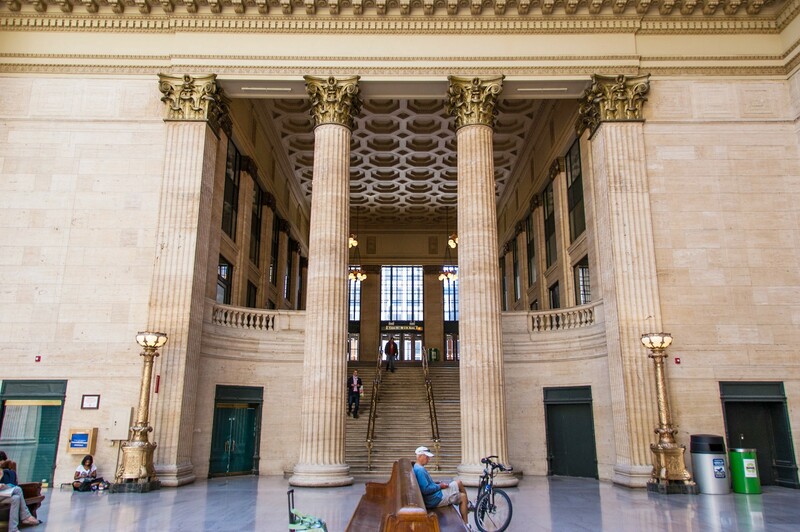 About 3 million Amtrak passengers use the station annually and an estimated 130,000 Metra commuters pass through the station each day. 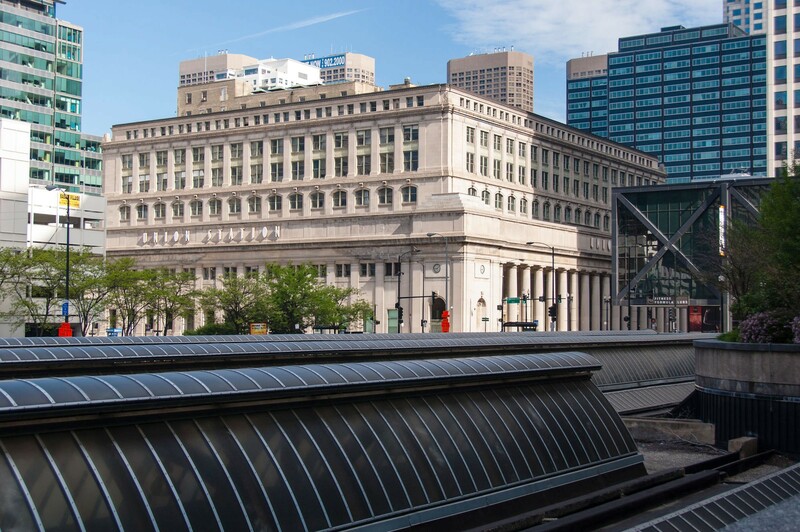 In keeping with its function as a transportation hub, Union Station now serves as the terminus for the recently completed Loop Link system that routes Chicago Transit Authority (CTA) buses through the Loop and throughout the city. Future restoration plans include widening concourse platforms to relieve overcrowding and reconstructing the skylight above the Great Hall atrium.